Banana Pancakes the whole family will love. A moist breakfast recipe made from scratch that can be personalized with chocolate chips or granola. My husband and daughter created this recipe to find a use for a very ripe banana. Make the whole batch and freeze. Lay pancakes flat on cookie tray and place in freezer for 1 hour. After pancakes are frozen, place in zip lock plastic bag for storage. For a quick school day breakfast, microwave pancake for 1 minute on high. For company, place pancakes in warm oven until heated through and ready to serve. Preheat cast iron griddle on stove top over low heat or start electric griddle on low setting. 1. In medium sized mixing bowl, combine all dry ingredients until thoroughly mixed. 2. Whisk in milk. Gradually add eggs, melted butter and lastly the mashed banana. Let sit 2-3 minutes and gently whisk again. 4. 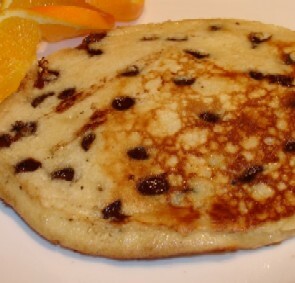 As bubbles begin to form and pop, gently slide a high-heat, plastic spatula under one side of the pancake and flip over. 5. Watch pancake closely as this side cooks faster than the first. Gently lift a corner of the pancake, when the bottom side begins to brown and batter appears to be cooked through, take pancake off griddle and serve.